It was a cold night in March, 2008. I had just finished up photographing an assignment downtown when I met up with Zach. I was dressed in slacks, dress shoes and a nice button down shirt, hardly exploring clothing. I exchanged my dress shoes for muddy combat boots and my jacket for an old sweatshirt. We grabbed cameras and flashlights then headed out for a recon mission. We parked the car on Central Parkway, and walked over to the stone fence. "That doesn't look too far down," I said. "Yeah, we should be fine," Replied Zach. Over the fence and down we went, neither of us landing on our feet. 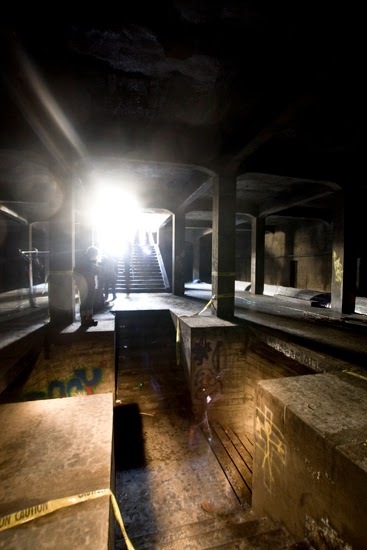 Tours of the abandoned Cincinnati Subway were once put on by a now defunct website and tours by the historical society were few and far between, not to mention they didn't allow cameras and charged you an arm and a leg. By jumping down near the subway portals along I-75, we thought we may able to find a crack in the wall or an old, open vent that we could one day use to slip through and take our own subway tour. Our luck had run out. While the internet was rampant with photographs and stories of explorers before us, the subway was now sealed up tight with metal sheets and steel bars of a post-9/11 world, putting off the dreams of one day seeing the subway. - Workers constructing the Cincinnati Subway in place of the now drained Miami-Eerie Canal. Photograph from Cincinnati-Transit. The history of the Subway's construction is fascinating. Many factors ranging from poor planning, city politics, the looming onset of the Great Depression, and the decrease in Cincinnati's urban population and demand for such a system eventually stopped the subway from completion (A more detailed and thorough history of the Subway can be found at Jake Mecklenborg's Cincinnati-Transit website). In short; the $6 million in bonds set aside in 1914 had run out by 1927. Construction of the partially completed subway ceased and was never resumed. Various uses were found for the subway over the years. Eventually a water main was constructed through the tunnels beneath Central Parkway, the station beneath Liberty St. was transformed into a bomb shelter during the Cold War and many other proposed uses for the subway tunnels have come up over time. The Subway exists today as a utility tunnel and a subterranean monument to a forgotten piece of infrastructure that would have changed the landscape of the city from what we know it as today. Two miles of tunnels still exist today beneath Central Parkway, as well as one other short section of tunnels crossing beneath Hopple St. The portals of the Central Parkway tunnels can be seen while drive southbound on I-75 towards downtown, just after passing the Hopple St. exit. I remember passing the portals as a kid, in the car with my dad on our way to a Reds game. He explained to me what they were and my subway curiosity was born. For my birthday one year he purchased a fantastic book called "Cincinnati Subway". by Allen J. Singer. My curiosity and desire to see the subway stems from my childhood. 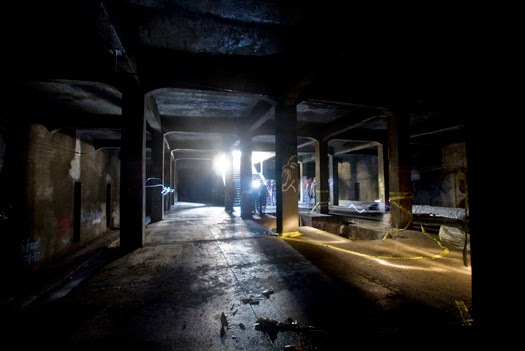 After years of waiting for a chance to take a tour and after a failed attempt on that cold March night, I got to see the abandoned Cincinnati Subway with my dad, the person who first sparked my interest. The tour by the Over-The-Rhine foundation started out with a presentation by John Luginbill, the man who oversees the maintenance of the 82 year old tunnels. The presentation offered participants a unique look at the construction of the Subway through historical photographs before beginning the tour. Following the presentation, we followed Mr. Luginbill to a small metal grate in the landscaped median in the center of Central Parkway, near where Race St. intersects. Upon opening it, we were met with stairs leading down into the subway. 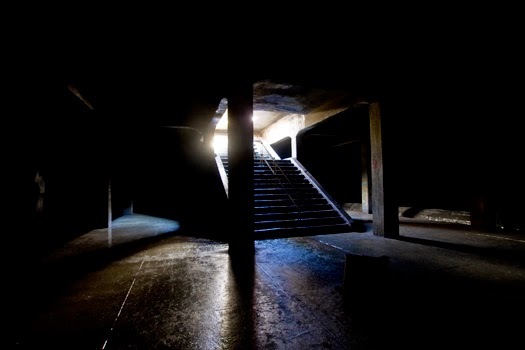 - Stairs leading from the surface into the depths of the Cincinnati Subway's Race St. station. I set up my tripod and camera. 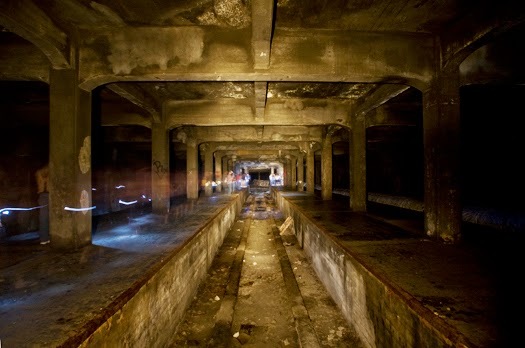 I had seen many photographs of the Cincinnati Subway on the internet. Most were taken prior to 9/11 before the subway tunnels were tightly sealed or during official tours with the city and were usually taken with the cameras flash unit on. I decided to use a tripod, long exposures on my camera and a 1,000,000 candle power spot light to take these photographs. - Looking East from the Race St. station. Interurban track seen at center while the Outbound track can be seen on the far left and the Inbound track (with the water main running through it) at right. The station at Race St. is essentially an island. It is the largest of all the remaining stations along the line. There are three tracks here: A track for outbound trains, a track for inbound trains (the track that now has the water main running through it) and a stub track that comes up to the back of the station stairs. This stub track would have served the interurban rail cars. - Looking east, the subway is three tracks wide at this point. Our tour guides ushered us to the west end of the station. We stepped off of the platforms down into the dirt and through the tunnels. 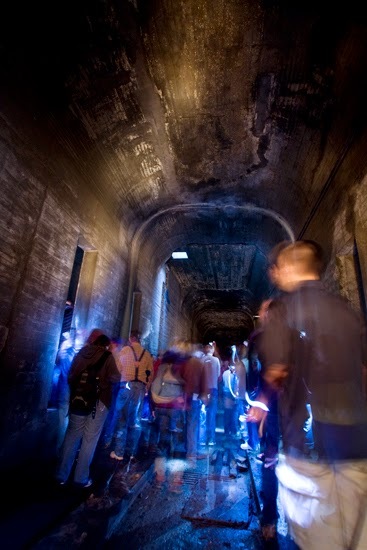 - Tour participants exploring the tunnels beneath Central Parkway. Unlike most railroads, the ties of the wooden tracks do not run horizontally. Instead, they run parallel to each other. The ties are made of solid oak and the steel track would have been bolted to the top. - The Race St. Station. The center track would have been for the smaller interurban rail lines, while the track in the background would have served inbound subway trains. That track now houses a water main. Today the subway exists more as a utility tunnel than a transit tunnel. The water main built in the 1950's runs nearly the full two miles of the tunnels, as do fiberoptic cables. - The Race St. station. Had it been completed, the Cincinnati Subway would have run cars similar to those found on Boston's Red Line and been one of few major cities to have completed a subway system before World War Two, joining the likes of Boston, New York and Philadelphia. 1) The cost of removing, relocating and constructing a new water main to replace the one running through the Subway. 3) Sections of land cleared for above ground sections of the subway are now the Norwood lateral and sections of I-75. - The Race St. station. The stairs in the foreground would've lead to underground concourses connected to buildings along Race St. These concourses were never completed. The stairs in the background lead to the surface. It seemed to go all too fast. My flashlight's battery was dying and the tour guides began ushering us out. After waiting so long, I had finally gotten to see the Cincinnati Subway and that experience was coming to an end. In a way, I felt things had come full circle. I first discovered the existence of the subways with my father and now I had experienced the subways with my father. It was a very happy moment as we exited the abandned Cincinnati Subway. - Tour participants exiting the Race St. station to the landscaped medians of Central Parkway. A very fitting tribute to Central Parkway's history. However, while the "official" tour ended, ours did not. My dad, my friend "IlDuce" of the website Ohio Urbex, and myself headed west along Central Parkway. We were riding parallel, above ground to the subway tunnels we had just seen. We arrived just South of Hopple St. near the White Castle. Parking the cars, we hurried across Central Parkway and down an overgrown asphalt path. 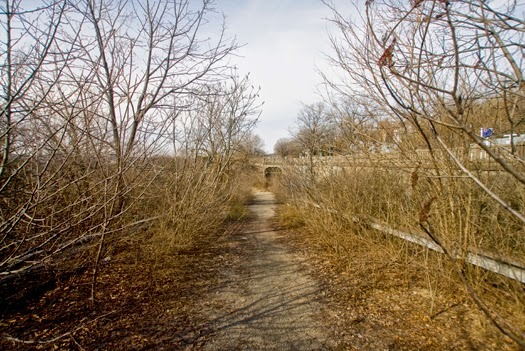 - Overgrown pathway leading to the Hopple St. tunnels. Through the brush we approached the Hopple St. tunnels. 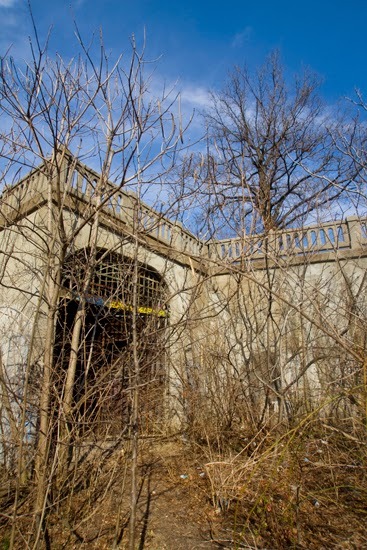 These parallel tunnels once followed along Central Parkway, crossing beneath Hopple St. They had no stations and ended just before Mitchell Ave. where an above ground station had once been located. The above ground station at Mitchell Ave. had been demolished some time in the 1950's and the Hopple tunnels were cut off to dead ends with the construction of the nearby I-75. - Entrance to the Hopple St. Tunnels. 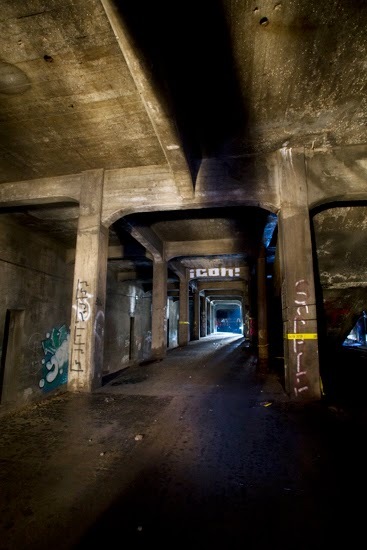 The tunnels run a length of approximately 400 feet before coming to a halt, littered with graffiti. Unlike the other tunnels, which house the water main and are kept sealed to keep said water main secured, the Hopple tunnels are wide open caves hidden behind the highway brush. 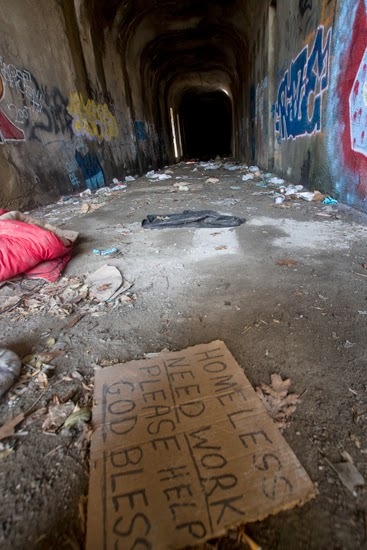 These tunnels often serve as a refuge for homeless persons seeking shelter from the outside elements. 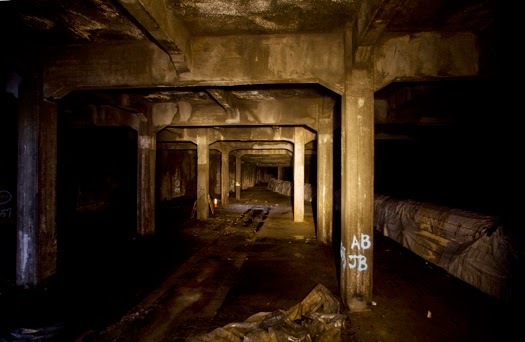 - The Hopple St. Tunnels often are used by Cincinnati's homeless population as a means of shelter. It's interesting to think how the subway's completion and operation would have affected Cincinnati as we know it today. Obviously, public transportation within the city and possibly the greater Cincinnati area would be drastically different. 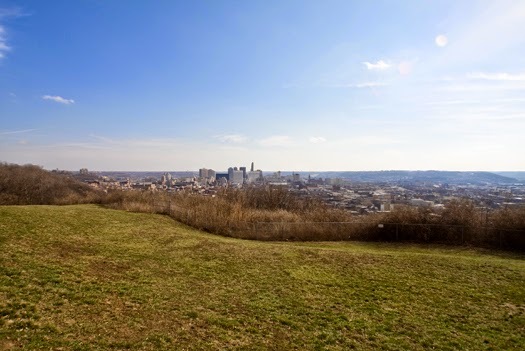 Unlike the cities of Chicago, New York, Boston and Philadelphia, Cincinnati has a smaller urban population, while the surrounding suburban region is home to nearly 2,000,000 residents. If a subway or light rail system were to be built today it would undoubtedly need to serve the Cincinnati region as a whole. The prospect of light rail has been voted down and looked down upon over time, but a regional light rail system could easily reap economic benefits and improve business/transportation within and around the city. As the old system lays dormant and incomplete, many Greater Cincinnati residents are pushing for the construction of a modern Streetcar system. The streetcar might just be the first step in the right direction of regional light rail, a prospect that could be so very beneficial to the Tri-State. Special thanks to Mike of the Over-The-Rhine Foundation for all of his help and work organizing this tour. I'd also like to thank John Luginbill of the city of Cincinnati for taking the time to conduct the tours! While this "official" tour only showed off one station, we made sure we eventually got to see the entire subway system. Check out all our adventures in the subway over the years, here. 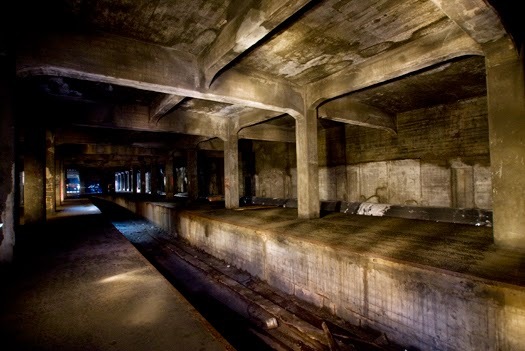 This article was the first of several involving the abandoned subway system. As of this update, there are still no future plans (and now, no more tours) to put it into use. To check out all of the subway articles, go here. As far as I know, tours are no longer offered and I won't tell you how to sneak in, save yourself the email. Fantastic stuff. The subway tunnels are a hidden gem and are still light-rail ready. I'm not sure that we'll ever see subway tunnels like this constructed in the U.S. again due to their high costs which further emphasizes the need to preserve and use these. Wow--fantastic pictures! I was on that tour as well, and you can see way more from your pics than you could when we were down there. Thank you for posting them. GREAT pictures! Thanks so much for sharing those. I REALLY wanted to go on this tour, but I had already signed up for a Cinciditarod spot before I found out about this tour so I couldn't go. I'm going to have to do some of my own exploring there this summer for sure! Great Pictures! 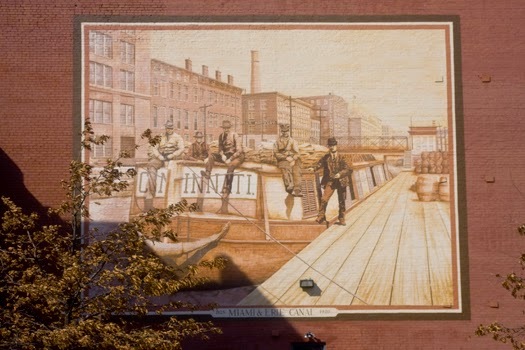 Just an FYI the mural was done by ArtWorks an organization that hires teens for public art projects around Cincinnati. another abandoned tunnel. but in new york..
im going down on Sunday. Beth, thanks for pointing out who made that mural, it's very well done! 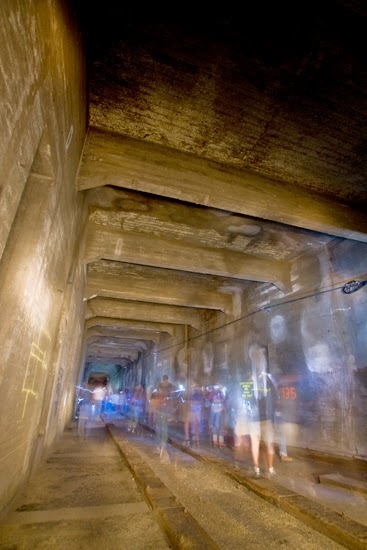 I wonder if they would ever use these tunnels to extend a streetcar/rail line out towards Price Hill. They could have rails extending out of the I-75 portals then along the Western Hills Viadcut out to the west. These tunnels will never be used to extend any streetcar lines as the point of streetcars are to be neighborhood circulators that have quick and easy access for its riders. Light rail would be a more appropriate use as the grade separation is highly desired for faster travel speeds and safer travel through city neighborhoods. Although the tunnels could be used for streetcars, it would not be very likely. The original intent of the 1927 rapid transit loops was to combine and merge with the interurban and streetcar lines. As mentioned in the above article, the stub tracks beneath the stairs were for interurbans/streetcars. Would it likely be used to support a new streetcar system? Probably noty, but using the smaller streetcar rolling stock would be a great way to use these tunnels without the huge cost of removing the existing infrastructure. Very Cool! Shame it was never completed. A subway would be awesome. Wow, Ronnie, great write-up. Did you do the rest of the tour or just the subway? I usually keep up on things like this, and I somehow completely missed out on this one. I've been down there a couple of times in the past, but never when I could get any good long exposure photos. It's nice to see some more clear pics of the Race Street station. I lived on Central Ave as a child and walked along the overgrown brush before I75 just to look at the subway tunnel. All we could see was the gates. Your pictures are awesome. I, too, am fascinated by the abandoned subway. I had heard the museum center offers tours, but haven't been able to find any more info on that. Absolutely spectacular photography, by the way! Very nice pictures! Hopefully street cars will be built if the subway never resumes consrtuction. More OTR tunnels are being made accessable. Check out the Prohibition Resistance Tour by the Brewery District. We are excavating a tunnel access stairwell at the old Crown/Schmidt Bros Brewery on McMicken and would welcome your documentation. Keep discovering, be careful and think about editing out the racist comments. No racist or idiotic comments like the few I had to delete will be tolerated. Keep that garbage to yourself. i have always wanted to go in the subway. i had one chance a few years ago and was unable to go. i hoping to get another chance except the next time i would not miss it. Several college friends and myself explored the system completely back in the early 80s, and the fallout shelter was a sight to be seen. HUNDREDS of the empty water & ration bins were stored there. A neat memory of the time were the paper 'blankets' also on hand, one of which still sits framed on my wall... A shame local politics have reduced this to nothing more than a hole for a water main. Climbing through the grills at the entrance off Central Parkway was a rite of passage back then, though probably not the smartest thing. After reading this article, the subway should be completed. Use of light rail cars thru the subway and then exiting the original tunnels and then run at surface levels to various outlying communities. Why waste what was started when automobiles are now choking the urban roads? The existing tunnels as a shunt of the streetcar line with a surface segment along Ezzard Charles drive would make an excellent connector to possible future commuter rail service from Cincinnati to Dayton. I don't believe there was a station at Mitchell Avenue. I believe the station was at Clifton Avenue. 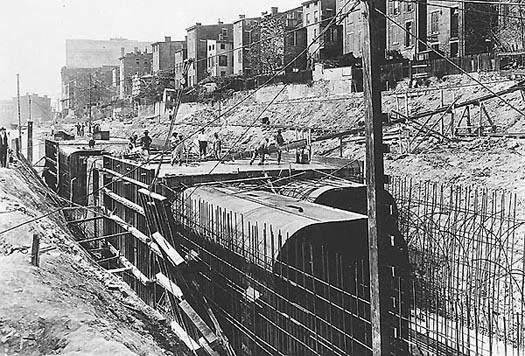 Stopping the Cincinnati Subway was intentional; the high-ups knew what would happen to the city if a subway system existed, and they wanted to delay any social progress in that area of the United States for as LONG as possible.